The Rab Alpha Flux Jacket is a highly-breathable, lightly insulated outer-mid layer using Polartec Alpha Direct technology and stretch fleece for 'on the move' multi-season use. Revised for Spring/Summer '16, the RAB Capstone Pant is a mid-weight, durable cotton-nylon pant, designed for bouldering and indoor climbing. 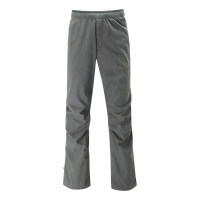 The RAB Crank Shorts are lightweight, stretch-cotton climbing shorts built with an elastic waistband. For days when you'll sweat bullets on the approach, then power through a cold belay, the Rab Alpha Direct jacket wicks moisture when you're pushing the pace and supplies warmth when you're at rest. Too wet? Too cold? Say buh-bye to fringe season excuses in the Rab Asylum down jacket. 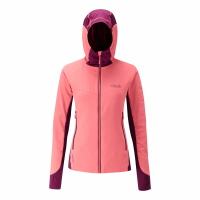 Its high-loft hydrophobic insulation repels light rain and snow and keeps you toasty on chilly days at the crag. First introduced more than 30 years ago, the Rab Kinder down smock is back and better than ever-lined with responsibly sourced duck down that's warm, water-repellent and fluorocarbon-free.